Certain 4cyl cars that get bad mileage..
...and by certain models, I mean my Toyota Camry, or any others that people on here might confirm are just not designed for good fuel consumption. Sorry if this has been covered, but I've wondered this for some time. I have a '99 Camry with a 4cyl engine and an automatic transmission. Not a car I would have picked normally, but I got a bargain on it from a relative, and just use it to commute back and forth to work (family car is a Prius). Anyway, the fuel mileage is, in my opinion, unacceptably bad. I get around 22mpg. I live in NJ, so hyper-miling isn't always practical or safe. I've looked up the ratings for that year/model, and they confirm that it's a very inefficient car (rated at 24mpg I think). That's terrible! For a 4 banger? I would think you'd have to be leaking fuel to get mileage that bad on such a small car. I've gotten that kind of fuel mileage in a pick up truck. It's mechanically sound, I'm good about maintaining cars, so it's not a bad thermostat or something, it's just that bad. I had a '91 Corolla before this, which also got what I considered to be mystifyingly bad mileage - 28 mpg, maybe 30. It was a tiny shoebox, how in the world can it burn that much fuel? I did all the fuel-saving driving tricks, to no avail - it's not like it will double my fuel mileage to where, in my opinion, it should be (I had a Saturn years ago, when I was young and dumb and drove fast, everywhere, all the time.. had no problem getting 40+ mpg). Are these cars designed like this on purpose for some reason? Any settings I might be able to change? Again, it's almost like they have to programmed specially to waste this much fuel. The 4 speed automatic (w/ torque converter) just kills the mileage. The Camry actually is rated 1 mpg better than the 1999 Accord. My Miata weighs nothing, has a tiny engine and "only" gets ~24mpg. That comes down to engine tune/design and transmission. It's simply not designed for mpgs. Your Camry comes from the era of cars when they got overweight(for safety, size and features), but before they started making cars/transmissions/engines any more efficient. It's probably because they got so big and heavy that, after a while, forced the auto makers to start making them more efficient, because modern cars are both heavy and fuel efficient. Driving something older and lighter or something newer and more efficient is my suggestion to your "problem". What does your driving environment look like? I drove a 1998 Camry on the freeway at 70 MPH and got 30 MPG. My Acura has a small 2.4L engine for its 3,400 lb weight and is rated to 22 MPG. I get 31 despite the close-ratio short-geared 6 speed. The Camry should do much better if you aren't speeding and stay off the brakes. BTW- Hypermiling doesn't necessarily mean slow, it means smart. I don't do slow. Last edited by redpoint5; 02-21-2018 at 12:29 AM.. There are many factors leading to that, so it's quite pointless to expect a gutless 4-cyl to be more fuel-efficient in a landyacht only because it has fewer cylinders than a V6 or a V8 that would be more favored by the low-end torque and better gearing, for example. But anyway, I'd still rather get a 4-cyl instead of a V6 with the same (or just marginally higher) displacement. I got 30 consistently out of my 95. Then again it was mostly freeway. About 15 years ago my parents told me they were going to get a "fuel efficient car" to replace their full size conversion van. I was shocked when they called back a week later and said they bought a Crown Victoria. I guess they thought 18 mpg was fuel efficient compared to 13 mpg. CAFE standards forced automakers to make cars more fuel efficient. Congress passed new standards back in 2007 and suddenly automakers "found" the technology to make cars 25% more fuel efficient over 5 years after 20 years of stagnation. These are the worst kind of graphs; the kind that cut the bottom off to make it look like fuel economy quadrupled. Fuel economy barely improved. Laws may have had an influence, but rising fuel prices and improvements in technology were also factors. 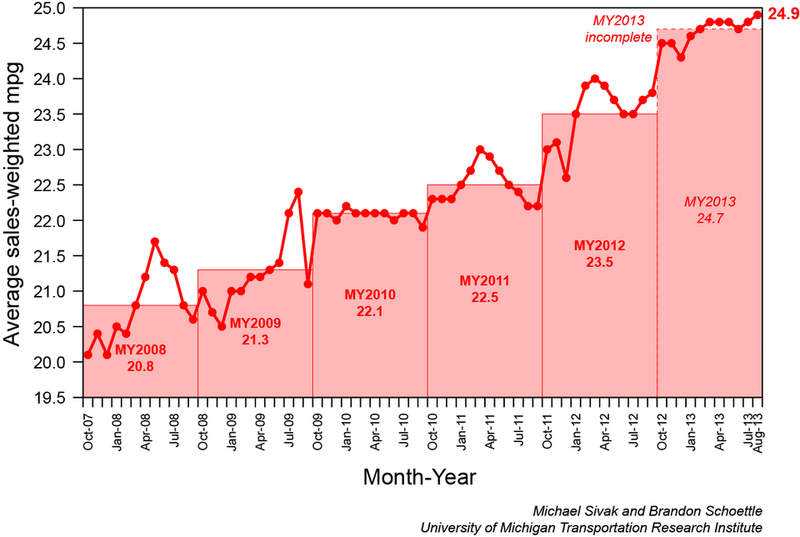 The nearly worthless graph represents an almost 20% improvement in fuel economy 6 years. This still terrible graph shows the trend started in 2004; 3 years before congress saved the world. Last edited by redpoint5; 02-21-2018 at 12:07 PM..